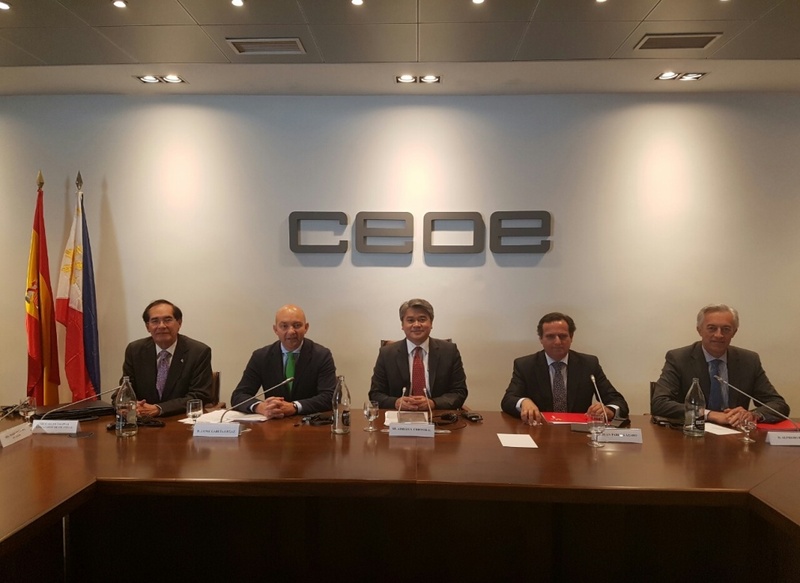 Secretary of Trade and Industry Adrian S. Cristobal, Jr. expounded on trade and business opportunities in the Philippines, at an investment forum held at the CEOE Headquarters in Madrid on May 3. 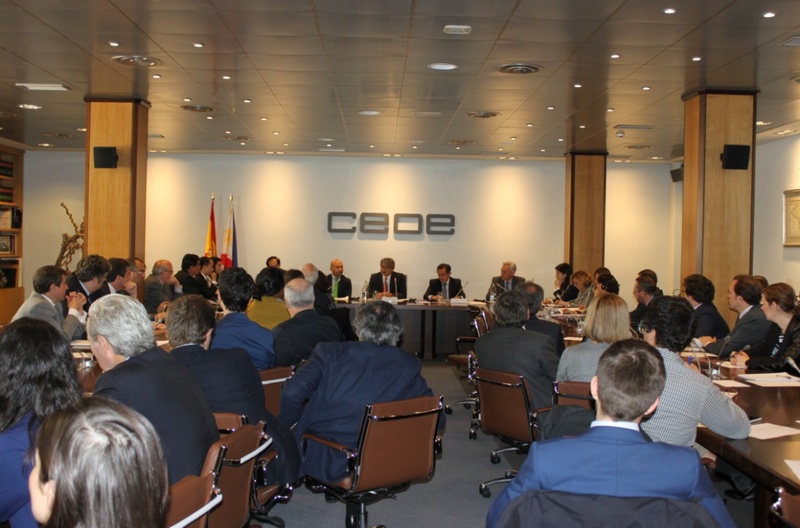 The forum was organized by the Philippine Embassy in Madrid with the assistance of Confederación Española de Organizaciones Empresariales, the Ministry of Economy and Competitiveness, Instituto Español de Comercio Exterior (ICEX) and the Camara de Comercio de España. CEOE Vice President Juan Pablo Lazaro welcomed Sec. Cristobal and more than 50 Spanish businessmen to the forum, while Mr. Alfredo Bonet of the Camara de Comercio urged investors to consider the Philippines as an investment destination given its positive performance and outlook. In his address, Ambassador Carlos C. Salinas highlighted the Philippines´ strong economic resurgence as evident in its improved credit ratings from agencies such as Standard and Poors. Amb. Salinas added that while Spanish companies continue to increase their presence in the Philippines, Philippine companies have also expanded their operations in Spain in the real estate and winery sectors. For his part, Secretary of State for Commerce Jaime Legaz assured that the Philippines remains a priority country for Spain, as he noted that discussions on the Philippine-European Union Free Trade Agreement will commence soon. He also acknowledged the strong tie-ups between Spanish institutions and the PPP Center, NEDA and the Department of Tourism. In his remarks, Sec. Cristobal enumerated the Philippines´ strengths in electronics, semiconductors, shipbuilding and the maritime sector. Within ASEAN, the Secretary noted that the Philippines has the second largest population and ASEAN´s 660 Million population is one of the biggest markets in the world. He added that while Spain ranks 10th in FDIs to the Philippines, Philippine exports to the EU increased by 27% in 2015. Sec. Cristobal shared that an important factor in PH´s economic growth is industrial peace with barely a handful of strikes within the last 10 years. He likewise cited three important developments in the Philippine economy, namely: 1) the liberalization of the banking industry; 2) the passage of the Cabotage Reform Act; and 3) the signing of the Competition Act. With respect to the forthcoming national election, he cited observations by risk analysts that it will not have a negative impact on growth. He said that infrastructure spending is targeted to reach 7% of GDP in 2017 from the current rate of 5%. Sec. Cristobal also echoed the positive outlook on the Philippine economy by analysts, regardless of the outcome of the May 9 elections.